Sit on your private covered balcony and watch the boats in the inner and upper harbours during the day and the sunsets at night. Walk to all downtown amenities. Take in whale watching, kayaking, water taxi and biking right outside your door on the wharf. BBQ or relax on the roof top patio. Located in the heart of downtown Victoria in the Mermaid building. On the waterfront of the harbour and the edge of the Gorge waterway, the Mermaid Building allows its guests to experience downtown Victoria, the Inner Harbour, the Gorge Waterway, the ocean, the upper part of the island and Vancouver, with ease. Some of Victoria’s most popular restaurants surround the building, making it easy to have gourmet meals with out the worry of taxis or drinking and driving. Take a Whale watching tour right outside the door. Or rent a kayak and glide through the harbour to the open ocean to discover the Pacific’s wild life. Or paddle up the Gorge waterway and enjoy the beautiful scenery. Salmon Fish with a charter or rent a power boat and just take it easy touring Victoria from the water’s perspective. Just steps away, the harbour sea planes take passengers in a half hour flight to downtown Vancouver, offering great shopping on Robson street, Theatres, Stanley Park and more, and all in a day allowing one to return home for dinner. The Mermaid neighbours Historic China Town with its many vegetable stores, restaurants and curio shops. Romantic horse drawn carriages carry passengers through the inner harbour past the parliament buildings, the world famous Royal BC Museum, live entertainment, Underwater Sea Gardens, Omnimax Theatre, Miniature World, Double Decker sight seeing tours, and tour buses to the renowned Butchart Gardens. Cycle, stroll, run, or even ride a horse on the picturesque Galloping Goose Trail. This multi-use trail, formerly a railway line, moves right beside the Mermaid Building, through urban, rural and wilderness scenery on its 55-kilometre journey from Victoria to Sooke. Whether you're commuting to work, meandering on a weekend afternoon or pacing yourself from Sidney to Sooke, the trail is yours to enjoy. Catch the little Harbour Ferry stopping at the Mermaid and travel right up the Gorge waterway to Tillicum and down to the Empress. Nothing has been spared in furnishing this space. It is fully equipped with a 32 inch flat screen Smart TV, DVD player, high speed Wifi and modem, microwave, dishwasher, stove, fridge, toaster, coffee maker, washing machine and dryer. The kitchen is fully equipped. We are a couple living in Oak Bay, 15 minutes from the condo. I have lived in Victoria for 22 years and Martin has lived here all his life. Property was very well kept and had lots of great amenities! The location could not have been better! Lots to look at on the water and a great location downtown meant that practically everything we wanted to see was well within walking distance. Great Experience - Beautiful Condo! This was my first time using VRBO and I must say the bar has been set high already. From booking to check-in, messages were answered promptly and lots of information was shared - I immediately felt at ease. 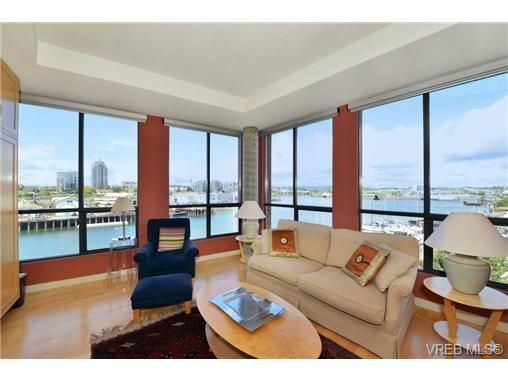 The condo is well-appointed, very clean and bright with beautiful floor to ceiling windows in each room. Excellent location and within easy walking distance to just about everything. Linens and towels were crisp and clean, bathroom was sparkling, even the kitchen appliances looked polished! Plenty of space and quiet and secure building. Gary was welcoming and friendly. I would highly recommend this property and in fact, I would book this again should I be able to make my way back to Victoria. Stunning inner harbour views and easy walking distance to shopping restaurants and many tourist attractions. Water taxi service on site! The condo was well appointed and comfortable. It is situated along a working harbour with great views of the new Johnson bridge. As well, the brewpub next door has a popular patio with harbour views. Gary was friendly, reliable and helpful. We had a great experience. We were do close to everything. Loved being right on the water. The condo was very clean and had many extras (washer and dryer, hair dryer, etc) that made our stay better. No complaints, would rent this unit again.